Bullfrog Pond is a great place to bird as you’re passing along on I-90. It’s a quick hop off the freeway and back on and it’s a great spot, easy to bird! Twenty-five miles east of Snoqualmie Pass and a thousand feet lower in elevation, precipitation plummets to roughly 25 percent of that at the crest. Ponderosa Pine and Douglas Maple—both indicators of drier habitats—are increasingly common from Easton to Cle Elum, and the birdlife changes as well. Exploring the Yakima River valley along this stretch, and the Cle Elum River valley from its confluence with the Yakima northward past Cle Elum Lake, allows one to observe a mix of bird species—some characteristic of the Wet Side, several others of the Dry Side, and many that are equally at home in both. An America the Beautiful or Northwest Forest Pass is required for trailheads mentioned in this section and to park in many areas of the national forest. For a first taste of these Eastside habitats, take I-90 Exit 78, marked Golf Course Road. On the north side of the interchange, go left (west) onto the frontage road (Hundley Road). After 2.1 miles, note the marsh-rimmed pond below the road on the right. Waterfowl such as Wood and Ring-necked Ducks may be found here, and the willows should have a Yellow Warbler or two. In another 0.1 mile, just before the road ends at a church-camp gate, turn right onto a fishing access road. Continue through more marsh and riparian habitat—birding gets better as you leave the freeway noise behind. The road ends in 0.5 mile at the Yakima River (Discover Pass required). The floodplain gallery forest of mature Black Cottonwoods may have Warbling and Red-eyed Vireos, and Nashville, MacGillivray’s, and Yellow Warblers. Return to I-90 and go east a couple of miles to Exit 80. Head north toward Roslyn on Bullfrog Road. Intermingling of habitats here allows many species of birds to nest in a very small area. Birding is sure to be rewarding in and around the open Ponderosa Pine forests, mixed forests (Douglas-fir and Grand Fir with an understory of Douglas Maple, alders, and willows), brushy thickets, lakes, and marshes—particularly from May through July. Cross over the Cle Elum River on Bullfrog Road. In 0.1 mile, Bullfrog Pond Bullfrog Pond is on the left, behind a guard rail. Pull off on the right 50 yards ahead at a turnoff for a private road, taking care not to obstruct traffic. Walk back and hop over the guard rail. Hooded Merganser, Vaux’s Swift, and Common Yellowthroat may be found around the pond. Walk along the old road that goes south through wet woodlands to the river. Look for Warbling and Red-eyed (in the tall Black Cottonwoods) Vireos, Black-capped Chickadee, Veery, and Yellow Warblers. There are a couple of records of American Redstart here. Both sides of Bullfrog Road north and east from the pond to the intersection with SR-903 (a roundabout in 2.1 miles) are open Ponderosa Pine woods, good for Hairy Woodpecker, Mountain Chickadee, Red-breasted Nuthatch, Western Bluebird, Chipping Sparrow, Western Tanager, and Purple and Cassin’s Finches. Take the second exit from the roundabout onto northbound SR-903 to the the former coal-mining town of Roslyn. Often, feeders are found in town, though the locations may change. All three Carpodacus finches (Purple, Cassin’s, House) are regular around Roslyn, and these feeders have proven to be a great place to study this sometimes confusing group, along with Red Crossbill, Pine Siskin, American Goldfinch, and Evening Grosbeak. Return to SR-903 in Roslyn and turn north. Travel through the town of Ronald and continue north for another 3.9 miles (name changes to Salmon la Sac Road after entering the Okanogan-Wenatchee National Forest). On the left is the entrance to Wish Poosh Campground (fee). There is usually a pair of Pileated Woodpeckers in the campground, and the mixed Douglas-fir and Douglas Maple forests around the edges have Black-throated Gray Warbler. You’ll note many other birds on a June or July walk about the marshy terrain toward Cle Elum Lake. Another 7.9 miles north on Salmon la Sac Road brings you to the Cooper Lake Road (FR-46), which immediately crosses the Cle Elum River, on the left. In the afternoon and early evening in summer, the bridge is a good vantage point from which to scan the skies for Black and Vaux’s Swifts. Vaux’s nest nearby, usually in tall snags among the Black Cottonwoods along the river. Black Swifts likely breed in the Cle Elum Valley. Continuing on this road five miles you will come to Owhi Campground, set in moist forest on Cooper Lake, and access to the high-country hiking trails of the Alpine Lakes Wilderness. Back on Salmon la Sac Road and headed upriver, you reach Salmon la Sac Campground by turning left at a fork in 1.2 miles and crossing a bridge. Black Swifts forage over the river and campground at treetop level in late afternoon. Trails up Polallie Ridge and the Waptus River valley into the wilderness area leave from here. More good hiking opportunities are available if you take the right branch at the fork onto FR-4330 (unpaved; be prepared for clouds of dust as cars stir up the glacial flour) and travel about 10 miles to Tucquala Lake. Common Nighthawks, swifts, and swallows often forage above this shallow lake and marshy meadow. Continue 2.5 miles to the end of the road. From here a gentle trail follows the Cle Elum River about five miles into the Alpine Lakes Wilderness through old-growth forest, then climbs 900 feet in a final mile to join the Pacific Crest Trail at Deception Pass (elevation 4,500 feet). In these lakes, open meadows, and wetter forests you may find most of the same species as lower down the valley, plus Barrow’s Goldeneye, Golden Eagle, Gray Jay, Clark’s Nutcracker, American Pipit, and Fox and Lincoln’s Sparrows. In years when spruces are producing a large cone crop, both Red and White-winged Crossbills should be looked for. Heading south from Roslyn on SR-903, take the second exit from the roundabout to continue on SR-903 toward Cle Elum. The USFS Cle Elum District Ranger Station (509-674-4411) is on the right, 1.5 miles ahead—a good place to pick up a map and inquire about road and trail conditions. Continue east 0.4 mile to Stafford Street, turn right, cross First Street (0.1 mile), and continue ahead. 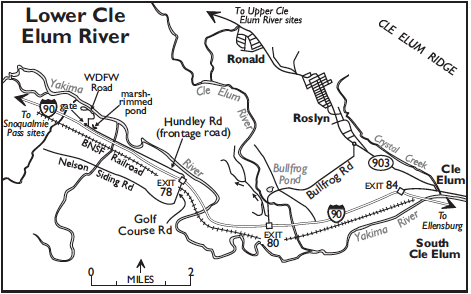 (If you are coming from the west on I-90, take Exit 84, which enters Cle Elum on First Street; go past the Safeway and turn right onto Stafford at the foot of the hill, following signs for South Cle Elum.) Go 0.4 mile on Stafford to the I-90 underpass, then make an immediate right (west) turn onto Charter Road next to the railroad tracks (one-way traffic regulated by a signal), to the Northern Pacific Ponds (0.2 mile). Occupying more than a mile of former streambed cut off when the railroad embankment was built across the floodplain, diverting the Yakima River into a new channel, these ponds have a good fringe of marsh vegetation and sizable cottonwoods. Wood Duck, Hooded Merganser, Ruffed Grouse, Osprey, Virginia Rail, Eastern Kingbird, Tree Swallow, Gray Catbird, and Nashville Warbler all nest. Return to First Street, turn right, and drive east through the business district. (Many homes on residential streets north of First Street and parallel to it have feeders and ornamental plantings that attract Bohemian Waxwings and various finches in winter.) In 1.6 miles turn left, then jog immediately right onto Airport Road, which continues east, then south. At the intersection with Masterson Road (2.4 miles) check the pines to the southeast for Pygmy Nuthatch and Red Crossbill. Continue south on Airport Road 0.8 mile to SR-970. Drive straight across the highway into a fishing access at the Yakima River (0.3 mile; Discover Pass required). Here, amidst tall Black Cottonwoods and thick understory vegetation, you might find Warbling and Red-eyed Vireos, Yellow Warblers, and other riparian birds. In winter, American Dipper is often found here. Return to SR-970 and go right to its junction with SR-10 (0.1 mile). 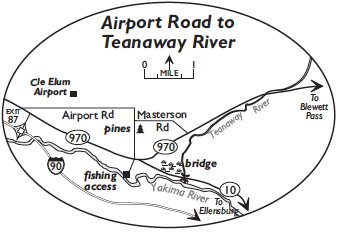 Turn right (east) onto SR-10 and drive one mile to the bridge that crosses the Teanaway River just upstream from its confluence with the Yakima River—a popular rafting put-in spot. Look for American Dipper nesting under the bridge. Red-naped Sapsucker, Western Wood-Pewee, Red-eyed Vireo, Veery, Gray Catbird, Nashville and Yellow Warblers, and Western Tanager are found in the riparian areas during the summer. Wood Duck, Cinnamon Teal, Hooded Merganser, and Common Yellowthroat are regular on the small pond and marsh just west of the bridge on the north side of the highway. 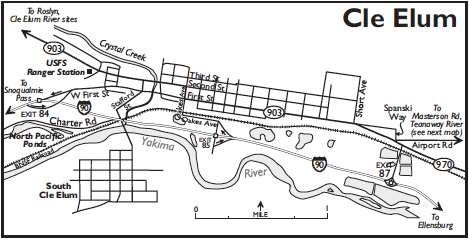 Scenic SR-10 continues on, following the canyon along the Yakima River toward Ellensburg and Kittitas Valley birding sites (page 277).